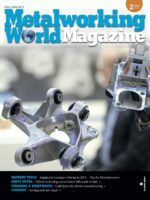 For almost forty years, Omet has designed and manufactured presses for different sectors, automotive and household appliances included, collaborating with primary multinational groups. 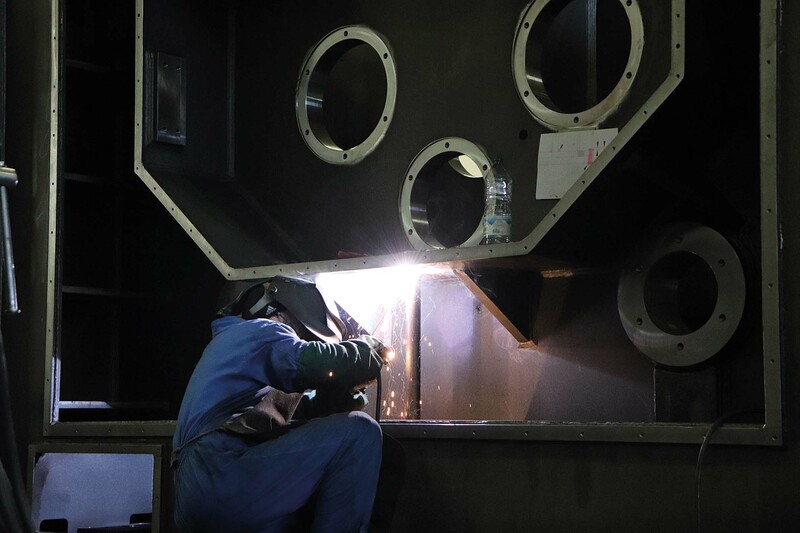 a historical manufacturing propensity, completed, for some time now, by a more and more skilled technical support, has become distinguishing element through the supply of after sale service, maintenance and regeneration services for any machine typology and brand. After working for years by press manufacturers, a close-knit group of 5 people decides to reap the fruits of the gained experience, establishing Omet in 1979. A strong business bent, competences and passion, which along the years generate a constant growth in terms of structure, production capacity, employees and turnover. A reality that has succeeded in treasuring its craft origins, developing its highlights and distinguishing traits, such as: detail care, the accurate choice of materials, flexibility and passion for one’s own activity. «At the same time – explains the general manager, the engineer Marco Romagnoli – Omet is a company that was able to accept the challenge of projecting craftsmanship into the future. With the target of making it become intrinsically the innovation accelerator». Approach that, since 2011 onwards, due to the occurred generational turnover, has benefitted from a further boost, which acted also as a driving engine to overcome the “unhappy” period of last years. «A positive trend – adds Mr Romagnoli – that has marked time very consistently especially since 2015 onwards. According to our perspectives, we aim at the 30% turnover rise by the next biennium». Target backed by the great organizational and rationalization capability of manufacturing processes, by the constant technological innovation and by design competences. Elements enabling the company to go on implementing high-quality, reliable and sturdy machines, able to provide a high precision degree and acknowledged on a world scale. 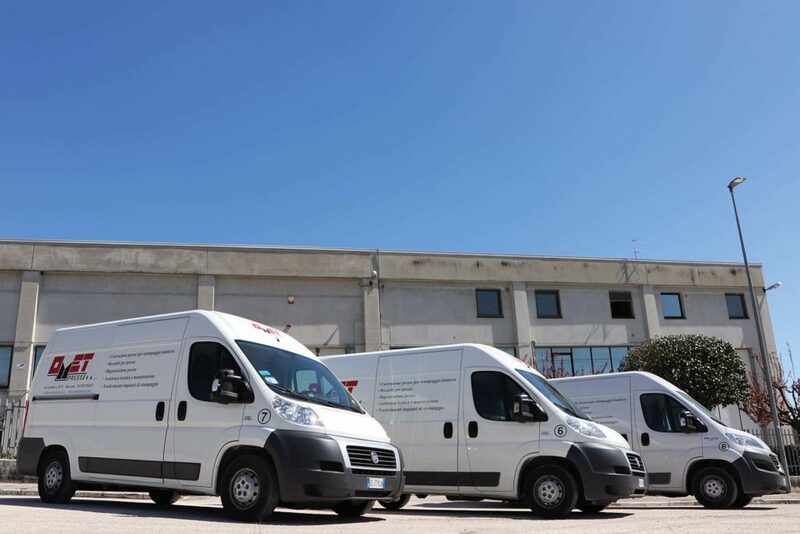 Today Omet relies on a wide productive factory at Sforzacosta (industrial zone of Macerata), where thirty qualified employees (rising, also to face the acquired job orders) accomplish all manufacturing phases. This allows a high quality control of each single component, as product guarantee. «Since 2013 – Alessandro Moro, the marketing manager, specifies, starting explaining, – also a subsidiary in Poland has been present, Omet Poland, set up to supply, through one dozen skilled technicians, after sale services to the numerous customers, especially operating in automotive and household appliance ambit, which have delocalized their productions in that market». A distinguishing and differentiating trait that allows the company to provide a support, maintenance and assistance service not only for its own branded machines but also for all press typologies installed at customers. A service become so important in time that it actually constitutes an autonomous business division. 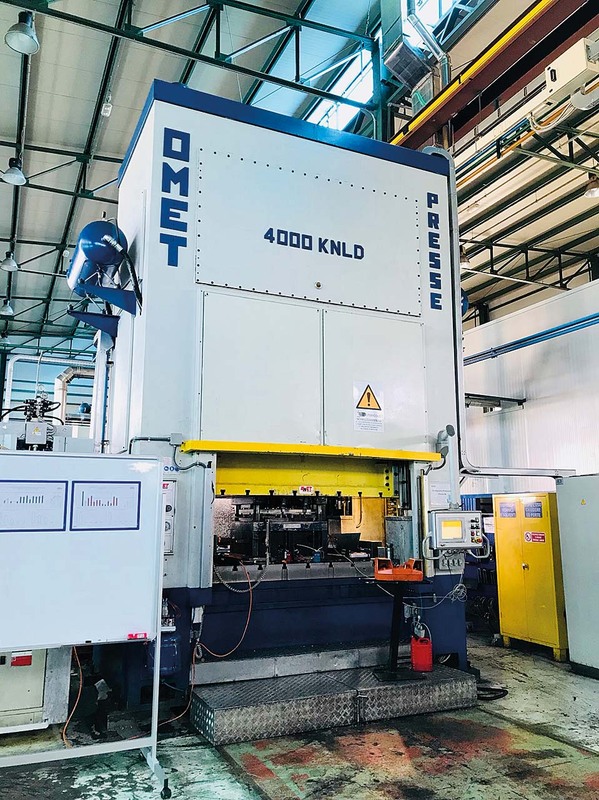 Omet produces a broad range of machines, standard and special mechanical presses, from the smallest 25- ton goose-neck version to 1,200-ton configurations, with a maximum working table of about 4,500 mm. 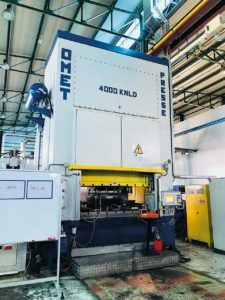 Established as manufacturer of mechanical presses, today Omet produces a broad range of machines and complete plants, whose design is cared by a team of specialized engineers who match strong sector experience and daily activity of research and experimentation, proposing innovative technical solutions that meet customers’ requirements at best. The decision of pursuing the high product quality has allowed the company to stand out both on the domestic and on the international market. «We can design and manufacture – specifies Mr Romagnoli –standard and special mechanical presses, from the smallest 25-ton goose-neck model to executions featuring 1,200 tons, with maximum working table up to around 4,500 mm. Referring to double sided presses, we can develop machines with the standard connecting rod/crank kinematics, with link-drive kinematic system, which allows the slowdown of the slide close to the BDC and therefore a “smoother” impact with the material under machining, or configurations with automatic stroke change». Thanks to the engagement of new engineers, today part of Omet team, the company can design and manufacture presses with other kinematic system typologies, that is to say different motion curves of the slide (like for instance esadrive and servo-presses). 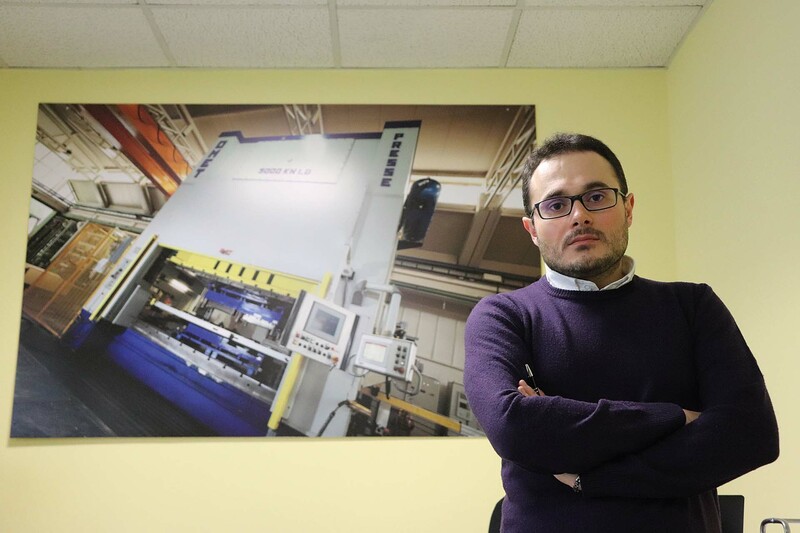 «Some years ago – further adds Romagnoli – we also started producing hydraulic presses up to 500 tons». More in detail, the range of mechanical presses in the standard versions includes the following typologies: machines with C-frame up to 250 tons, with 1/2 connecting rods; with monolithic or modular double-sided structure from 160 to 1,200 tons, with 2/4 connecting rods. 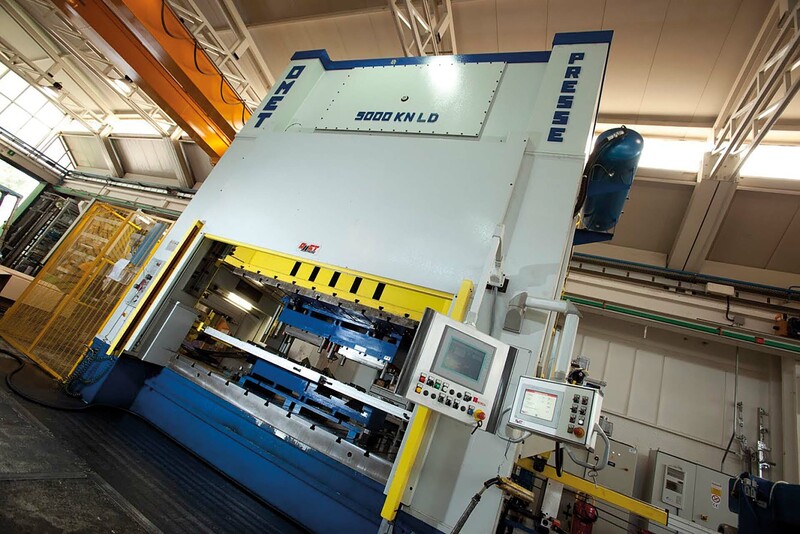 The range of hydraulic presses in the standard versions includes instead the following executions: monolithic or modular double-sided structure, from 160 to 500 tons; C-frame, from 10 to 250 tons. «Over one thousand of machines produced since the company set up are at stake – adds Romagnoli – for a total of 130,000 tons of thrust force introduced on the market». Outstanding numbers, confirmed by national and international customers that have trusted the company and are still confident in it. To offer a more and more complete service, on demand, Omet can directly supply complete forming lines composed by the press, by the sheet metal feeding line starting from coil, transfer, perimeter fences and so on. As alternative, for the forming process starting from squares, the supply includes also handlers. «Not mere supply – specifies Mr Romagnoli – but also testing and obviously the certification of the entire plant. Finally, the possibility of supporting customers also during the training phase, to teach them how to exploit at best and most correctly the potentialities offered by the machines and plants we propose». In 4.0 compliance, besides the manufacturing of machines already conforming to the demanded requisites, Omet is investing resources also in the development of a new and important project. OMET stands out on the market for the service of support, maintenance and assistance not only for its own branded machines but also for all press typologies installed at customers’. «The target– ends Romagnoli – is having the most possible direct control of the machine. We are working at a lean but as efficient application able to provide an exhaustive overview of machining data, of the just-in-time status, but also of ordinary maintenance and control interventions. Opportunity that would allow also an immediate monitoring of statistical character, studied to provide data and information in very simple manner».